Cushing’s disease is caused by an overproduction of a hormone called cortisone. Cortisone is released by a the adrenal gland, which is located next to the kidneys. Sometimes Cushing’s disease is caused by a tumor by the adrenal glands, which can cause excess cortisone production. To complicate matters a bit, the production of the adrenal glands is controlled by the pituitary gland, located in the brain. Under normal circumstances, the pituitary gland will create a hormone called ACTH, which will make the adrenal glands produce cortisone. Sometimes there is a tumor in the pituitary gland, which causes an overproduction of ACTH. In this case, an overproduction of the hormone ACTH is what in turn causes the adrenal gland to overproduce cortisone. So two dogs can have the same symptoms, but have different causes of the disease. Cushing’s usually shows in older dogs, and is more common in smaller dogs. If your dog is eating and drinking more than they have in the past and is urinating more frequently, have a closer look at their body. Look for hair loss, especially around the belly area. Also have a look at their stomach area from the side. If you see a “pot-bellied” appearance, you should consider taking your dog to the vet for a checkup. You might also notice that your dog’s muscle’s are weaker, and your dog can’t walk as far or climb stairs as well as before. Your vet will do a physical examination of your dog, and will take their blood. Your vet will be looking for excess hormone in your dog’s blood to determine the cause. Your vet may also do an examination to see if any tumors can be found. Most tumors that cause Cushing’s disease are benign, but your vet may want to check. A number of herbs will help with animals that have Cushing’s. the most important of which is a class of natural herbs called adaptogens. Most people define adaptogens as herbs that can be used to modulate stress. A great example of an adaptogen is Ashwaganda. The root of Ashwaganda has been used for centuries, and has been shown to be an effective way to reduce stress and support adrenal function. [2, 3] Other herbs include burdock root and gingko biloba, which act as a blood purifiers, and dandelion which can support adrenal function. If your dog has been diagnosed with Cushing’s disease, it is best to get some sort of treatment. Dog’s with Cushing’s that have not been treated tend to have lower life expediencies . The good news is that dogs with Cushing’s disease usually respond well to treatment. Cushing’s isn’t usually fatal, and a with Cushing’s that is being cared for should live a healthy life. R. Berto. The role of nature in coping with psycho-physiological stress: a literature review on restorativeness. Behav Sci (Basel). 2014 Oct;4(4):394-409. K. Chandrasekhar, J. Kapoor, S. Anishetty1; Full-Spectrum Extract of Ashwagandha Root in Reducing Stress and Anxiety in Adults. Indian J Psychol Med. 2012 Jul-Sept; 34(3): 255-262. K.A. Head, G.S. Kelly. Nutrients and Botanicals for Treatment of Stress: Adrenal Fatigue, Neurotransmitter Imbalance, Anxiety, and Restless Sleep. Alternative Medicine Review. 2009 14(2). Hyperadrenocorticism in a Primary-Care Hospital: Treated with Trilostane versus Untreated. J Vet Intern Med 2017;31:22–28. As we know, dogs come in all shapes and sizes. The difference between a small chihuahua and a great dane is about 60 times. That would be like sitting next to another person who is 600 centimeters tall! There are more similarities to dog nutrition than there are differences. For the most part, dogs of all sizes need the same amount of protein, fat, and carbohydrates, for example. But as you might imagine, with a size difference that large, there will be differences that you need to account for. For this post, I’ll be focusing on small dogs. The main point to realize is that small dogs have very high metabolism. This means that they can use the energy in their food very quickly. On top of that, they have small stomachs to go with their small frames. So they are not able to eat as much as other dogs of larger sizes. This means that a small dog’s diet has to be more nutrient-dense than that of a larger dog. If you are making food for a small dog, be sure to keep this in mind. A good supplement to think about is Spirulina, which has a lot of nutrition in a very small package. Studies show that small dogs die more often from endocrine diseases . These are diseases that affect the level of hormones in the body. A lot of common diseases are endocrine diseases– diabetes, Cushing’s disease and Addison’s disease to name a few. Perhaps this is because it is more difficult for small dogs to regulate hormones, given their small size and metabolism. In any case, if you have a small dog, consider herbs that help regulate hormones and blood pressure like ashwaganda, burdock, ginger, and dandelion root. The root (and leaves) of a dandelion are a great way to get vitamins and minerals, but most people just pass them by. Humans have used Dandelion root since ancient times to help with a variety of ailments. In fact, the scientific name for Dandelion is Taraxacum, which is derived from Greek words “taraxos” meaning “disorder” and “akos” meaning “remedy”. Scientists are just now looking into the properties of Dandelion root, and are finding that the ancient Greeks were onto something. The first written account of Dandelion being used as a therapeutic agent were from Arabic physicians from the 10th and 11th century. They were using dandelion root as a treatment for liver and spleen damage. Recent studies have pointed in this direction. Studies have shown that Dandelion does have a protective effect on the liver in mice. Two sets of mice were fed alcohol every day, and one set was given dandelion extract as well. The mice that were given the dandelion extract suffered no liver damage from the alcohol. 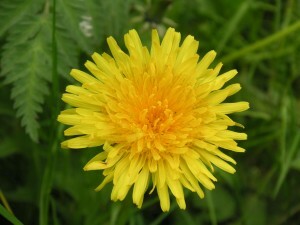 This suggests that dandelion extract can protect the liver from damage. What is a diuretic? A diuretic is anything that increases the flow of urine. Your dog will urinate more, and have a lower water content in their blood. Because of the lower water content, there is less pressure on the blood vessels, and blood vessels contract. This has a few health benefits such as lower blood pressure, and a lower risk of heart attack and stroke. Diuretics also help with more minor things like headaches. Because of this, synthetic diuretics are prescribed to people (and dogs) that have extremely high blood pressure, liver cirrhosis, and a high risk of kidney failure, heart disease, or stoke. Essentually, diuretics relieve stress on your dogs organs that they can operate more effectively. See the part about liver cirrhosis? It seems that Arabian physicians knew what they were talking about when they prescribed Dandelion root back in the 11th century. One of the side effects of the most prescribed dieuretics is that they tend to deplete minearals such as calcium and phosphorus. Dandelion has been shown to have enough vitamins and minerals that it compensates for any losses that might occur. Compared to prescribed diuretics, dandelion is fairly weak – studies show that it would take 8 grams of Dandelion leaf to compare to 80 miligrams of furosemide (the most popular presciption diuretic), but I don’t think this is a bad thing necessarily. If your dog has serious heart, liver, or kidney problems, and your vet prescribed a diuretic, don’t use dandelion as a replacement. However, I think there are many health benefits to useing a light dietetic as an everyday prevention of stoke, heart attack and other illnesses. Long term studies of dandelion use don’t exist, as it is very expensive to do, and not enough people eat dandelion root on a daily basis to do any comparative studies. But there are many studies of another popular diuretic – coffee. Studies have shown that frequent drinkers of coffee have a lower incidence of stroke, lower rate of heart problems, lower rate of liver disease, lower blood pressure, and a lower risk of kidney stones and gallstones. What all of these diseases have in common is that they are all related to blood, and blood vessels. Caffeine is very bad for dogs, so don’t give it to them, but it does suggest them health benefits for long-term use of diuretics. Some other long term studies of coffee consumption show a higher risk of diseases such as osteoporosis, which may be linked to the fact that coffee may take some important minerals out of the blood stream. However, I’ve already mentioned that Dandelion root has enough minerals to balance out this effect, so I don’t think this will be a problem with Dandelion. Dandelion has been shown to have a strong choleretic effect, meaning that it helps the liver produce bile. This is more evidence that dandelion root is great for the liver, but it has important implications for digestion. Bile helps pancraceatic enzyes digest fats. It is also extremely important for the absorption of Vitamin E.
A common theme here is that something that people thought was helpful has been proven to be helpful. They didn’t do scientific experiments, but were working with tradition and trial and error. I find it fascinating that the more we look into things, the more we come back to the herbs and foods we’ve been using since ancient times. I hope to be exploring this a lot more in this blog, and how we can use this to improve the health of our dogs. Stay tuned! It seems like everyone is talking about how important antioxidants are to health. It’s certainly true that they are important, but I want to talk about why antioxidants are so important. And to do this we have to back up a little, and talk about chemistry a little bit. Everything is made up of atoms. And these atoms are made up of protons, electrons and neutrons. The electrons orbit around the center of the atom, like planets around the sun (it’s far more complex then that, but it doesn’t matter for this discussion). For complicated reasons, only two electrons can use the same orbit at a time. These two electrons are called electron pairs. Atoms like having two electrons in all orbits. This is why atoms form molecular bonds. A molecular bond is when two atoms share an electron, so that they both can have an electron pair. In fact, if an atom ends up with with only one electron in an orbit, it won’t last very long. Chemists call it a “free radical”, and it’s very useful for synthetic chemistry because it’s so reactive. But the reactivity in your body is not good at all. Free radicals in your dog’s cells can cause a chain reaction, and can damage your dog’s cells. But Free radicals are created by normal metabolic processes, so your dog’s cells have natural defense mechanisms. So what are the defense mechanisms? Antioxidants. I’ve already spoken about one of the most important antioxidants: Vitamin E. Vitamin C is another important antioxidant as well (I’ll talk about that one next week). The structure of vitamin E is such that it is one of the few molecules that can hold a free radical stably. So once a free radical is created Vitamin E will take the electron, and stop the damage. As I mentioned, free radicals are created by normal biological processes, but they can also be created through pollution, and radiation. Free radicals have been implicated in cancer as well. This makes sense because free radicals can damage DNA just as well as any other compound in the cell. So antioxidants will slow the occurrence of cancer, and help fend off the effects of radiation and pollution. which is why they are so important. And remember, as I talked about last week, the best sources for vitamins are natural sources. I’ll talk about some good sources of Vitamin C next week! I haven’t yet talked about an important aspect of nutrition – vitamins. You may have noticed, also, that with all of my discussions of supplements, everything I give to my dog is in a natural, food based form. There are a lot of reasons for that. I certainly believe that there is a place for western, Pharmaceutical solutions to disease. I studied biochemistry and molecular biology, and worked as a medicinal chemist for many years, synthesizing potential cancer cures. But when I look at nutrition, in both humans and animals, I’ve come to the conclusion that natural sources are the best way to get your nutrition, and the best way to feed your dog. Vitamins are the name for a set of compounds that are required for many biological functions in the cell. Vitamins as a group vary widely in how they appear chemically and their molecular functions, so it’s difficult to discuss them without focusing on one particular vitamin at a time. For this week, I’m going to look at Vitamin E.
Vitamin E is important for the circulatory system, is an important anti-oxidant, and may be an important way for cells to signal each other. But to understand the difference between natural and synthetic Vitamin E, we need to understand a little more about synthetic chemistry. The important thing to realize in the picture are the Solid triangles and the dashed triangles. Molecular compounds are, of course, 3-dimensional objects. 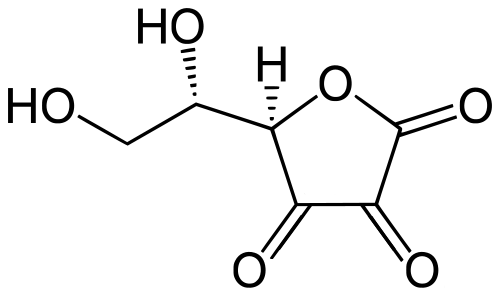 Chemists compensate for this by using the solid triangles and dashed triangles to represent areas where the molecule would go outward, off of the paper and inward, into the paper. It not terribly important to be able to visualize the molecule perfectly. The important issue is when you realize that with current chemistry, it is impossible to create only molecules with the specific 3-dimensional structure above. And very, very difficult to separate the different forms. So most manufacturers of Vitamin E supplements just don’t do it. Another piece of this puzzle is that your body, and your dogs’ body, can only use one specific 3-d form. All of the others are excreted away. So if you are taking Vitamin supplements that were chemically synthesized, about half of what you are taking is completely worthless. Naturally occurring Vitamin E, in foods, will only occur in the form that is usable. There are studies that show that that vitamin E from natural sources is absorbed twice as effectively as that of synthetic. What are good food sources for Vitamin E? A lot of green leafy vegetables and tomatoes, are great for vitamins in general (Spinach may be bad for dogs though). Squash has a high amount of vitamin E as well. Of the foods that we’ve disscussed previously, bee pollen, spirulina and flax seed are all sources of vitamin E.
This is another reason why natural foods are great; by supplementing with natural foods, you get many benefits from just one supplement! Traber, MG; Elsner, A; Brigelius-Flohe, R. (1998) Synthetic as compared with natural vitamin E is preferentially excreted as Alpha-CEHC in human urine: studies using deuterated alpha-tocopheryl acetates. FEBS Letters 437: 145-148. Now that I’ve talked about both Fatty Acids and amino acids, I can talk about another supplement that I give my dog – Spirulina. Spirulina has become popular because it’s a great source of protein as well as a source for essential fatty acids. Spirulina gets its name from its shape. 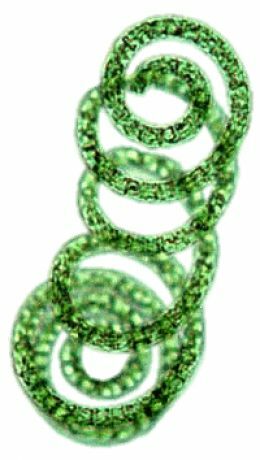 Spirulina is an algae that forms into small spirals. Although the name is recent Spirulina has been around for a very long time. When Spanish conquistadors came to the new world, they found the Aztec people farming spirulina on lake Texcoco, which is now right next to Mexico city. Spirulina was harvested by letting it grow on the lake, and then scraping it off of the top and drying it. Modern Spirulina is grown in similar ways, except that it is grown in a way to protect it from contaminants. As I mentioned before, Spirulina is a great source of protein – over 60 – 70 % of dry Spirulina is protein. Spirulina is a complete protein too, although some of the amino acids contents are fairly low. Spirulina is a great source of both Omega-3 and Omega-6 fatty acids, and a lot of vitamins and minerals (although it seems that some people are stressing the amount of vitamin B12 – Spirulina actually has very little B12). The Omega-3 Fatty Acids available in Spirulina are Docosahexaenoic acid (DHA) and eicosapentaenoic acid (EPA). This is great because these two compounds are very easily processed by your dog. I give Spirulina to Tsuki along with bee pollen, even though they are both great sources of protein. When it comes to supplements, many different sources are better than one! In my previous posts, I talked about essential amino acids and how important they are for your dog. Now I’d like to talk about Essential Fatty acids, which sound similar, but are very different chemically. Where amino acids are used to produce enzymes for your dogs cells, fatty acids are used for a various functions in the body, from creation of energy to many different roles in regulation of important cell functions. Like essential amino acids, essential fatty acids are needed to be included in the diet of your dog. In chemistry, every atom in a compound has a number. Omega-6 and Omega-3 fatty acids get their names from the position of the first double bound towards the end. Again, they look very similar when they are drawn like this, but to a dog’s cells they are very different. A deficiency in Omega-6 fatty acids can cause dermatitis, slow growth and slow wound healing. A deficiency in Omega-3 fatty acids can cause memory loss (in humans at least), eye problems, arthritis, and heart problems. So both types of fatty acids are extremely important, but what most people miss is that there is an important balance between the types of fatty acids. Many of chronic diseases in the west such as cardiovascular disease, diabetes, autoimmune disease, rheumatoid arthritis, and even depression are associated with chemicals in the body that increase with a high Omega-6 : Omega-3 ratio. It is thought that humans (therefore maybe domestic dogs) have evolved with an Omega-6 : Omega 3 ratio closer to 1:1. What is the ratio in today’s fast food world? Closer to 16: 1. And dog food has followed that path too. In fact, Omega-3 Fatty acids aren’t even a required nutrient for dog foods (although most dog foods have some amount). Most dog food is based on red meat, which has a very high amount of Omega-6 fatty acids. As I mentioned in my previous posts, red meat is important for its variety and amount of protein. 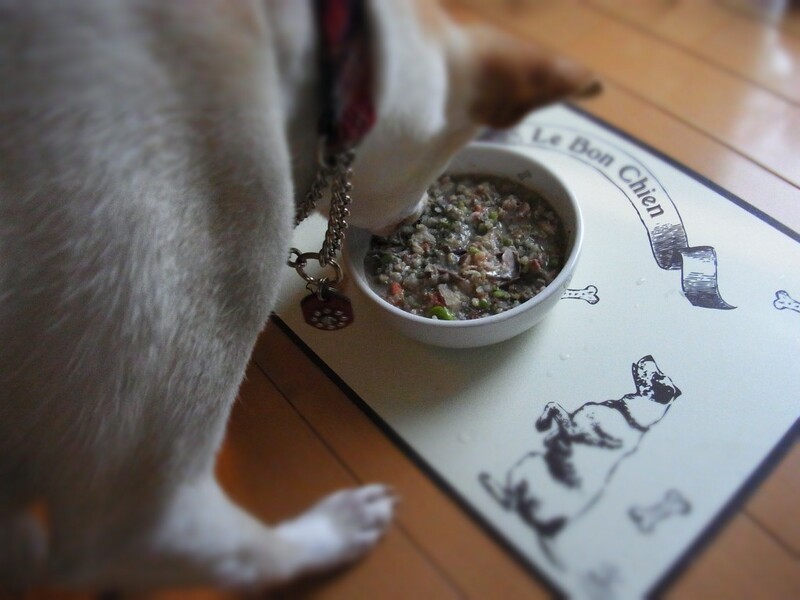 But when it comes to Tsuki’s diet, I try to keep an important balance. Fish is the best meat source for Omega-3 fatty acids, so I feed her meals with fish as often as I can. Also, if I am feeding her red meat or chicken (her favorite), I either sprinkle on some ground flax seed, or put in a little flax seed oil. Flax seed has some of the highest amount of Omega-3 Fatty Acids available in plant form. The key here is balance. Everything has its place in a diet. The key is to be aware of what is good for your dog, and to include as much variety as possible. Now that summer is in full swing, I wanted to talk about something that is extremely important for dog owners: watching out for heat stroke. Dogs don’t cool down the same way as humans do. Instead of sweating, panting is the main way that they keep themselves cool on a hot day. A dogs tongue is thinner and longer than a humans. When a dog pants, it is pushing air across its tongue and cooling the blood that is circulating through. This is why a dog will take short, quick breaths when it is hot. Dogs also have sweat glands on their paws and their nose, but these factors still make it more difficult for a dog to keep cool than a human. Because of this, you need to be very careful with your dog in the summer heat. A dog’s normal temperature is about 101°F (about 28 C). Anything above 104°F (40 C) is an emergency situation. Heat stroke can be deadly, or can cause permanent injury to the brain and other internal organs. More than anything, you need to be aware of what is normal for your dog. If it is panting too much, or will not get up, or is drifting out of consciousness you need to take immediate action. If you suspect that your dog is suffering from heatstroke, wrap a wet towel around their head and body. After that, I recommend giving them a bath of lukewarm water. Don’t give them a bath with water that is too cold, as it will actually cause a worse reaction. If you give them a bath with water that is too cold, the blood vessels in their skin will contract, which will push the heat further into your dog’s body. The best thing to do in the summer is to restrict your dog’s activities when it is hot outside. 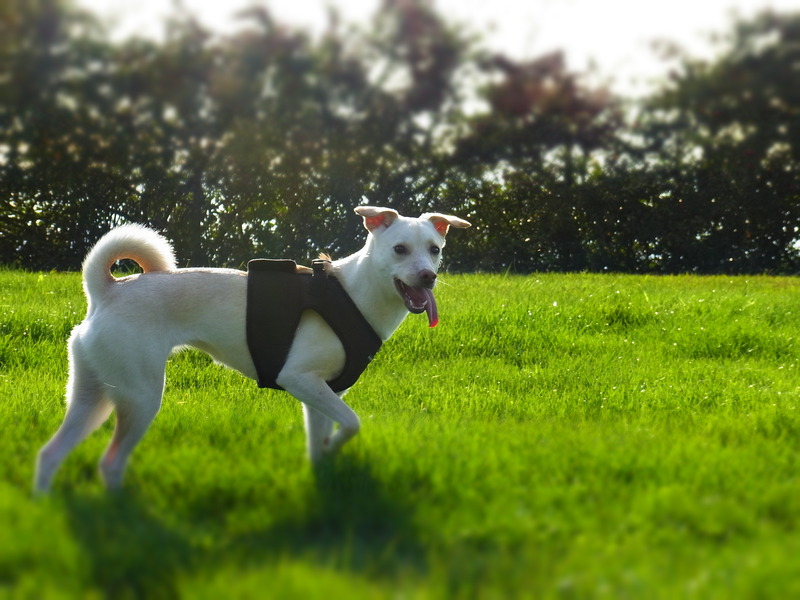 Don’t let them run around during day in the summer, and watch out for any signs that your dog is overheating. And definitely do not leave your dog in the car. A car can get hot enough to kill in a matter of minutes. In my previous posts, I described protein, and then talked about what essential amino acids are. In summary, amino acids are the building blocks for the enzymes that your dog needs in order to be healthy. Your dog’s cells can produce all amino acids except for what are called Essential Amino Acids. A dog has to injest essential amino acids in order to stay healthy. This has important implications if you are making your dog’s food. Different types of food has different types of ratios of amino acids. In fact a lot of plants are missing some essential amino acids. So you need to make sure that the protein content of your dogs food contains a balance of amino acids in the ratio that your dog needs. This sounds more difficult than it actually is. Most meat will contain a good amount of essential amino acids, and any excess will be excreted in your dogs urine. So don’t let this scare you away from cooking for your dog. In fact a lot of dog food manufacturers will dump chemically synthesized amino acids into the food, so that they can claim that they have a “complete food”. I plan on getting into this on later posts, but I beleive that the best way for a dog to get all its nutrition is the natural way – through fresh food – not through chemicals. In any case, in order to make absolutely sure that Tsuki is getting the correct balance of protien, I like to supplement her food with a few foods, one of which is Bee Pollen. All flowers contain male and female reproductive elements. Pollen is the male spore of a plant. In order to reproduce, a plant will release their spores and hopefully a spore will come into contact with a flower stigma, which completes the reproduction cycle. Where do bees fit in? Bees collect pollen because it has a great diversity of nutrients. Flowers have evolved to accept animals like bees because it allows them to spread their pollen more efficiently. The great thing about the pollen collected from bees is that bees have a great ability to collect only the best, most nutritious pollen. Besides honey, pollen is all that bees eat. So bees have evolved to know which pieces are the best, and only collect those. The bees then add honey or nectar to the pollen and an enzyme that prevents the pollen from germinating. The bees then carry it back to the hive. The bee pollen that we eat is collected from small traps outside the hive, created so that bees drop some of the pollen that they have collected. Bee pollen contains all essential and non-essential amino acids. Bee pollen has more protein than than the same size of red meat! Besides this, bee pollen contains nearly every known vitamin and mineral necessary for a healthy diet. It is loaded with antioxidants and has been shown to have anti-microbial activity. Bee Pollen is a great supplement to add to your dog’s food. Along with other supplements, it can ensure that your dog is getting all the nutrients that your dog needs in a healthy, natural way!